Six books from the latest edition and the adventure they offer. I've been a Dungeons & Dragons fan since I was a teenager. Some of my favorite memories revolve around my group of friends gathering in the basement of my best friend, Tony, who practically had all the books from Second Edition at his place, and hammering out adventures between late-night runs to the 7-11 down the street. Of course, we were teens, so we didn't follow the story too often and took our interests elsewhere, like fighting in warrior tournaments or trying to steal money from warlords. There was even a time we got locked in a prison, and one of our teammates decided to eat us for sustenance, so no one lived after that campaign. Good times. But in all the years I've been playing with random groups, I never took it upon myself to buy the books or become a Dungeon Master (DM). I can't really pin down why; I just always had more fun being the player, and not the pseudo-god who runs the entire world, which is both pretty easy and extremely complicated depending on the guidelines you set forth. So with the help of the fine folks at Wizards Of The Coast, I was able to get my hands on the essential books and some additional guides from Fifth Edition, to give it a shot for the first time. For those of you who have no idea what I'm talking about, here's a quick D&D primer. Back in the mid-'70s when Dave Arneson and Gary Gygax created and developed the game and published it under TSR, there weren't a lot of plans at the time to update the game; they simply added material on top of it as needed for roughly the first decade. In 1989, they released Second Edition, solidifying everything from the previous regular and advanced editions into one core game, with revised editions coming later in the mid-'90s. In 2000, we got Third Edition, followed by 3.5 in 2003, which, depending on who you ask, is the definitive version of D&D, before things started getting wonky with 2008's Fourth Edition. In fact, a lot of similar games like Pathfinder use 3.5 as the base set of rules and mechanics for their systems. After fan upheaval over Fourth, the Fifth Edition in 2014 that appeared to be a solve-all to the issues from Fourth with new elements added brought players back. "I think it was a classic case of a game design not meeting the needs of its intended audience," said Mike Mearls, Senior Manager of D&D in an online interview. "We saw a very divided opinion on the game. People who loved very tactical combat loved [Fourth], as did those who bought heavily into 3.5 and used all of the new game options as they came out. Where it really suffered was with those groups that used only the core rulebooks, the Player’s Handbook, Dungeon Master’s Guide and Monster Manual. I think to those groups, who made up a significant portion of the D&D audience, Fourth Edition felt like a very startling, sudden and inexplicable change in direction. That group seemed to prefer a faster-paced, more open-ended game, and [Fourth] had trouble delivering on that." The six books I received all cover different elements of the game, so that anyone can learn the mechanics, as well as adapt them for what you need. The two most important to the set were the Player's Handbook and Dungeon Master's Guide. The Handbook, in its most basic sense, is here for you to create and design a character from scratch, as well as learn how to use them in the game once you start leveling up. It also contains a lot of information that average players may not look up or be interested in, but can easily be referenced if and when the situation arises. The Guide, on the other hand, is much more in-depth about designing a world for DMs to control. You have the power to create the layout, characters, treasures, environment, perils, puzzles, in the sky and under the ocean. There's even a section where you can build it just by rolling dice and letting fate decide what's around you. 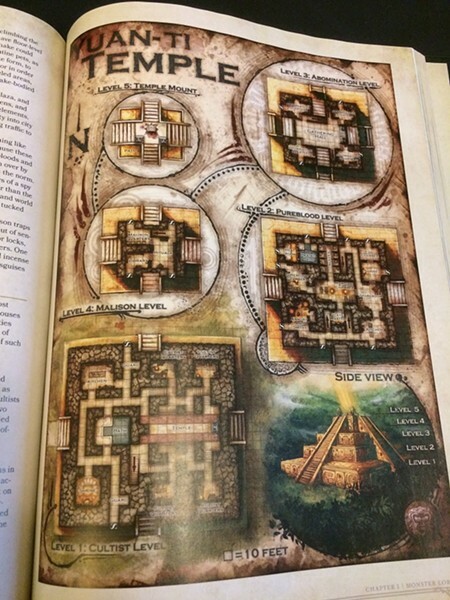 Fifth Edition actually made a lot of these areas seem much simpler than they used to be, which is a great bonus for people just getting into the game. "Almost every part of the game received a revision, in almost every case to make things run faster and smoother," said Mearls. "I’m really proud of the concentration mechanic. It’s a simple way to prevent wizards, clerics, and other spellcasters from stacking up tons of spells at once. Instead, it forces you to cast one powerful spell at a time. That simple change made the game much simpler and did a lot to make those characters balanced against the other classes." The game also added some new additions that became both interesting and challenging to deal with, most prominently the "Advantage/Disadvantage" mechanic. "We had a class in Fourth Edition called the Avenger that Rob Heinsoo and I designed. It had an ability that allowed the avenger to roll twice and use the higher roll for the attack. It was one of my favorite 4E classes, and I always wanted to try to use that mechanic to cut down on the variety of fiddly, little bonus and penalties you had to add to each and every die roll," said Mearls. 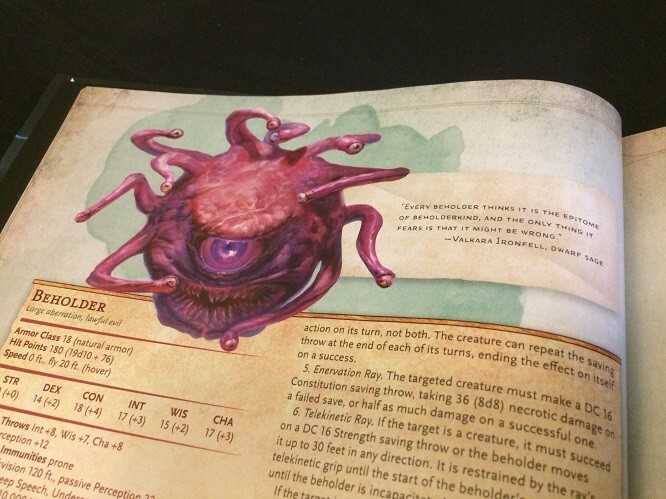 The next book is the one people know the most but probably understand the least: the Monster Manual. No adventure is worth playing unless there's a suitable enemy in your path, and trying to level up without enemies is tedious without battles. This is your massive guide to almost everything you could populate the world with as a DM. Now the reason I say it's misunderstood is because beginners, and even some experienced players, will throw in monsters left and right that make little sense being there. The goal of using the guide is to create challenges based on where you are. A good example: a Hell Hound, which is a demon-like creature, most likely belongs around more evil areas, or with a master if they're trained, not randomly living in the woods with nowhere to call home and nothing special to guard. It's up to the DM to determine the best way to utilize the hundreds of monsters inside to get the best experience for players, and the best story out of the game. It's an amazing book, but one that should be read before use. The next two books that added greatly to the experience were Volo's Guide To Monsters and Storm King's Thunder. 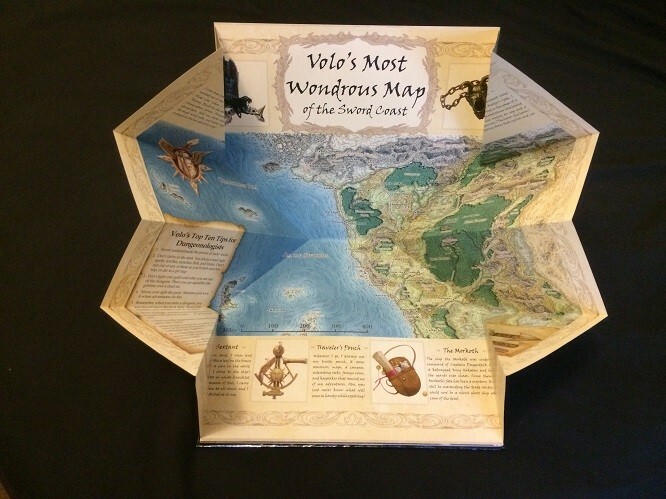 Volo's Guide is essentially an expansion to the Monster Manual, with greater detail on the more famous versions you'll come across. Let's say your story involves a Hag or a group of Hags; there's a section in here to give them backstory and insight into how their characters act and react, so that a DM can tell a better story as to what drives them to cause whatever problems they're causing. It also adds stat blocks where you can customize those characters with dice rolls, so you can make them always unpleasant and greedy with a need for gossip, or make them a superstitious hoarder who grows weak during the full moon. You're also given maps and items specific to those creatures so when your weary travelers make their way into a forbidden lair, there's a purpose to where they need to go and what to find. 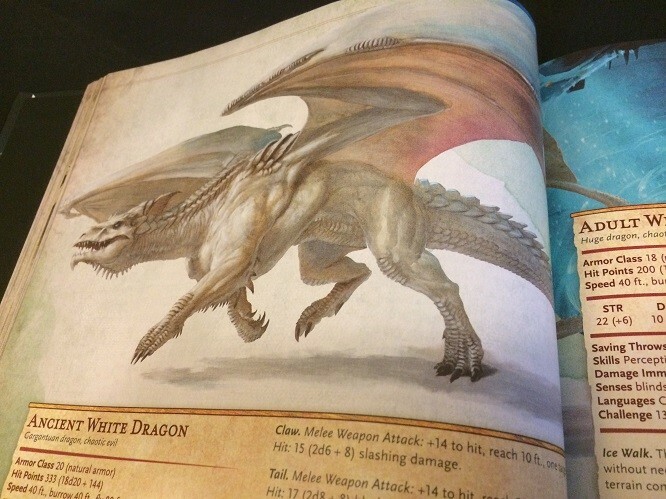 "While Volo’s features new monsters (or DMs to pit against adventurers and even a few for players to use to create their characters, the bulk of the book provides insight into the culture and psychology behind some of D&D’s most famous creatures," said Mearls. 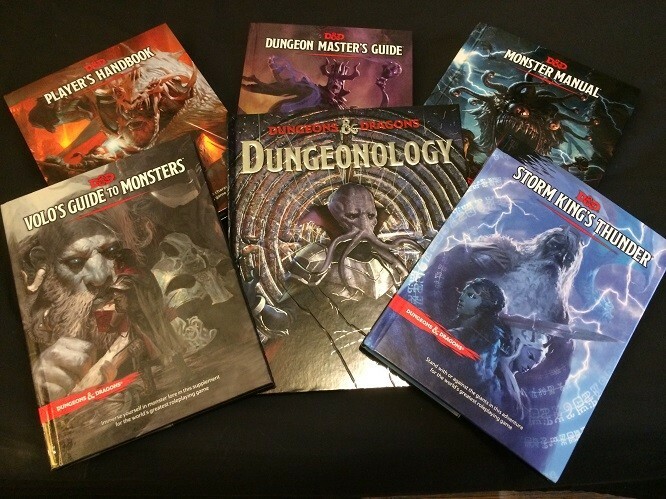 "It’s intended to inspire DMs with new stories and fresh approaches to some of our most classic monsters. We tried to think of how an intelligent monster, like an orc, would see itself as the hero of a story, what motivates it, and how its culture and environment shapes its view of the world. I think it helps DMs add some depth to their stories in ways that they might have overlooked." Storm King's Thunder, however, is an entirely different beast of a book. This is a full adventure, twelve chapters that will take you through a complete quest from start to thrilling conclusion. You and your crew will set off through The Savage Frontier, a cold and snowy landscape with few people and many leftover remnants of fallen empires. I'm not going to give away much involving the plot, because that's not how true D&D works. You set forth into the unknown with nothing but what you carry, and to spoil the story to this guide would be a disservice to those wishing to play it. But take my word for it, it's pretty damn good, and would be a fitting game to play during these long winter months. 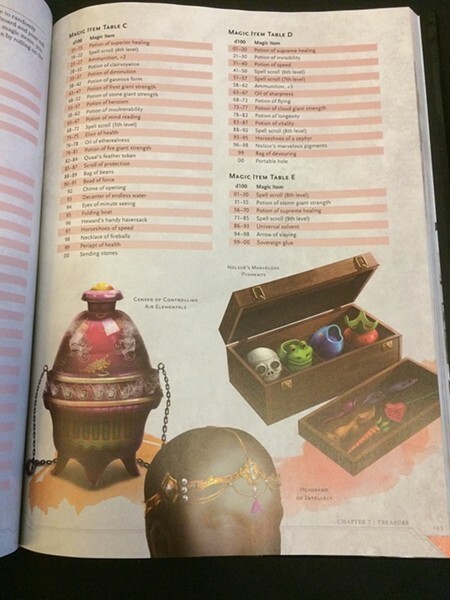 The final book is cool in a very different way: Dungeonology. Unlike other guides and books in the series, this is more of a condensed version for novice players, presented in a pop-up style book. If I were to use video game terminology for a moment, if the standard Player's Guide were Final Fantasy XV, this would be the equivalent of The Legend Of Zelda: still an adventure game, but on a reduced scale. This is basically a book for kids who may be interested in the game, but aren't quite ready to be playing it yet with all it's complexities. This book gives them something they can latch onto without being overwhelmed. "We were approached by a British company called King’s Road who wanted to add D&D to their -ology line of books for kids," said Mearls. "We leaped at the chance. What I love about Dungeonology is that it captures the sense of wonder and magic that D&D creates for new players. 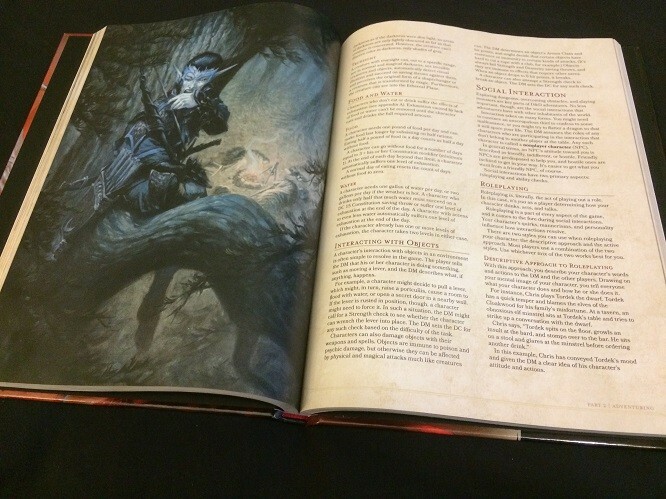 It’s the perfect introduction to the concept and world of D&D for a beginner." So with the exception of Dungeonology, I took a day out of my life and put together a quick scenario utilizing the Storm King's Thunder as my guide as DM. A few select friends who had been playing for years crammed into my apartment with a couple pizzas, and we spent roughly four hours going through the initial chapter. Since all of them were experienced, and came with their own characters from previous games, getting through most of the first chapter was a breeze. 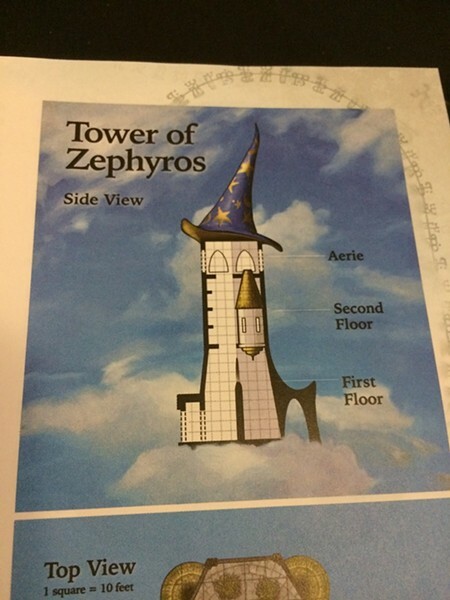 We ended up having to pause at the Tower of Zephyros, but the overall feeling was that the game was a success. Our friend David, who hates playing anything that isn't 3.5, even agreed that this edition fixed up a lot of areas. And he was quite happy playing as a Tiefling, a character class that up until Fourth had only been a monster to deal with. As a first-time DM, I felt like I was truly in control of my surroundings for a game, and it was a nice touch having players who wanted to play rather than do their own thing just to be "that" kind of player. But if they had gone off, there were extra avenues I could have taken to make the game flow, which is a nice advantage to have with guides like this. There's a lot to recommend the Fifth Edition set of Dungeons & Dragons books. The advantage I would recommend to parents is that the first three books equal the cost of a high-end video game, and those are the major items you need to start a big campaign. Beyond that, all you need is paper, game dice (which cost around $5-15 depending on where you buy them), pencils and an imagination. Plus you can find all the basic rules online for free, as well as player sheets you can print up and YouTube videos to help you along. Sure, there are tons of things you could purchase on top of it, but that's for the collector and advanced players to deal with. This is a game that, depending on whose hands it's in, could provide hours of free entertainment with friends. "Really, if you’re curious about D&D your best bet is to dive on in," said Mearls. "Don’t worry about the rules or learning how to do everything right. Half the fun as a beginner is learning to play as you go."